Frank McGoldrick is one of those people who seem to have a talent for everything they turn their hand to. An accomplished welder and fabricator, he graduated to designing and building bars, shops and restaurants throughout the UK. After selling his business five years ago, Frank moved to the French Alps and was finally able to return to his childhood passion—motorcycles. Finally getting some time on his hands, he decided to build his own motorcycle, “with a style and individuality that most major manufacturers seem to neglect,” he says. 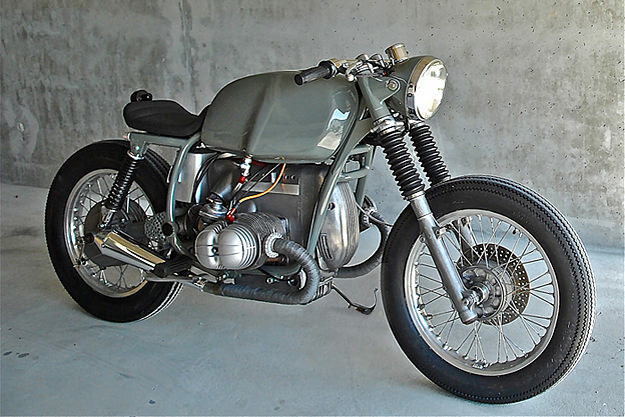 He wanted to build a light, functional, everyday motorcycle that “worked”. And also to create a blueprint for his MAKE brand—a stylish object with an ethos that could be transferred to furniture, clothing, art, interiors and cycles. The first job was to strip down every nut and bolt, remove the engine and wiring, and return the BMW to its component parts. Frank cut the sub frame from the main frame, de-tagging and de-lugging as he went along, and reworking the rear suspension geometry for more aggressive handling. The finished frame was was bead blasted, powdercoated and painted. Meanwhile in the workshop a new competition clutch was fitted, heads were polished and ported, and the carbs were overhauled and rejetted. The casings and wheels were meticulously polished by hand. 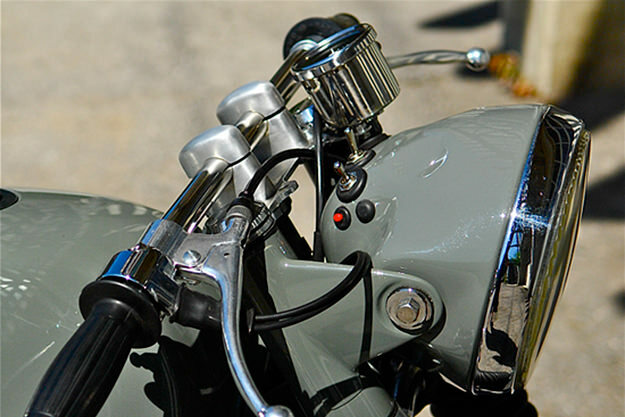 Frank rewired the bike and fitted a small red starter switch and single speedo into the headlight assembly. 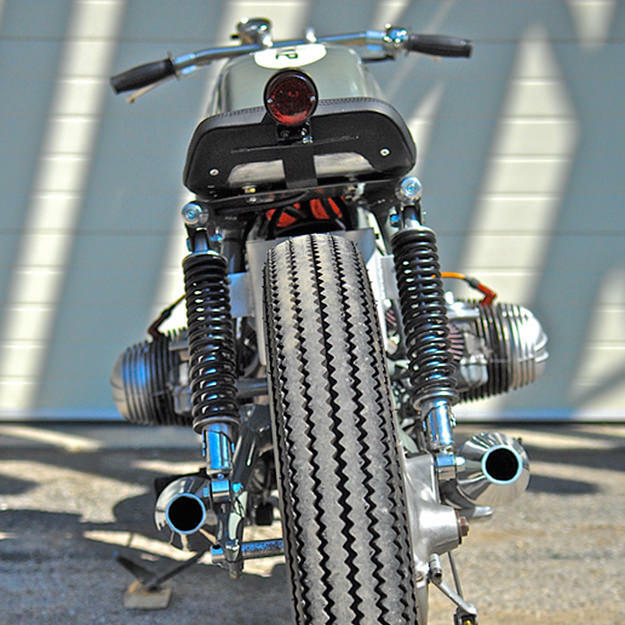 A solo leather seat was fabricated, and the exhaust system was shortened, with race mufflers fitted. A custom battery box and lightweight gel battery were installed, along with new levers, throttle, and stainless steel brake and fuel lines. 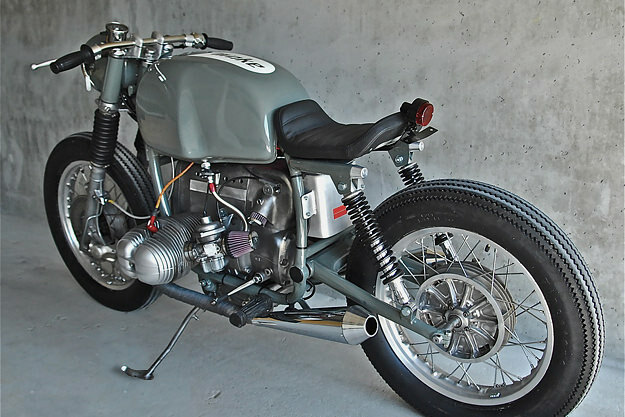 The original bike had a dry weight of 210kg but the MAKE BMW weighs in at 178kg. Frank estimates a 10 bhp increase of over stock, boosting performance still further. Sketches are underway for a new project and there are two possible options at the moment: a 1970 Triumph T120/650R or an early 70s Harley. It’ll be interesting to see what Frank makes of those.